Scientists estimate that polar bears diverged from brown bears between 250,000 and 130,000 years ago—a recent split when it comes to evolutionary history. Lasting genetic similarities make the two bears biological sister species, more closely related to one another than to any others. Aside from their fur colors, the similarities are obvious. Both bears are powerful predators, with male polar bears growing as large as 1,500 pounds, the same size as the world’s largest brown bear subspecies, the Kodiak bear. But Ursus maritimus has also evolved to match its polar environment, growing a longer snout than brown bears’ and larger, paddle-like paws, both of which aid polar bears in hunting seals. 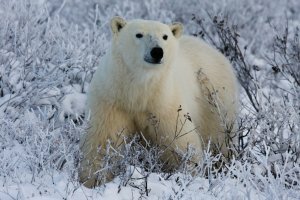 This specialization has now made the polar bear more vulnerable than its more widespread, adaptable brown bear relative. As sea level rise threatens the polar bear’s Arctic habitat, things will change for grizzlies, too. Climate change is melting the polar bear’s homeland—the year-round ice of the Arctic Ocean—at an alarming rate. As their seal-hunting grounds turn to open water, the northern bears are struggling to adapt. Many are spending more time inland, and farther south. At the same time, warmer temperatures are opening new habitat to grizzlies, as the borders of plant growth and corresponding animal communities inch northward. The result of these parallel trends? The old sisters—polar bears and brown bears—are crossing paths more often. And the results are fascinating. A study published in 2015 in the Journal of Mammalogy by Susanne Miller, James Wilder and Ryan Wilson tracked interactions between the two species during the lengthening autumn open-water period along the coast of the Beaufort Sea in Alaska. As hungry polar bears ranged inland to scavenge whale remains near villages, new competitions emerged. The researchers found it more common for members of the same species to fight over food, but also recorded previously-undocumented competitions between polar bears and brown bears, during which the grizzlies, like typical older siblings, asserted social dominance. When the two species meet, they don’t always fight, however. Another phenomenon amplified by climate change is a rise in documented polar bear-grizzly mating. What to call these hybrids? Scientists and reporters have used the combination names “grolar” and “pizzly,” while some have suggested combining the bears’ Inupiaq names—nanuk (polar bear) and analak (grizzly)—and dubbing the crossbreeds “nanulak.” Whatever the name, the results are visually arresting and provide for a lively debate. What does the changing Arctic landscape mean for brown bears farther south? While recovering grizzly populations in the Northern Rockies won’t be seeing polar bears on their doorsteps anytime soon, we can learn from the lessons of the north. Grizzlies will range into new habitat when it opens to them, whether it’s newly-exposed coastline in the Arctic or stream corridors on Montana’s Rocky Mountain Front. And from polar bears to private ranches, they will do so without heed for what may be waiting for them. That’s why grizzlies need habitat protection and conflict prevention as they continue to recover and expand their range. While their northern sisters face an uncertain and vulnerable future, we can work to make sure the Great Bear of the Lower 48 has room to roam for generations to come. See how you can help today.